Any incoming U.S. president should be concerned about his out-of-the-gate strategy for the nation and what he will accomplish in the first 100 days in office. This has been the case since President Franklin Delano Roosevelt and has become a favorite media topic ever since. The whole world will be watching for this strategy and these initial actions as Donald Trump takes the reins on Jan. 20. Watch for the Basis of the Stated Strategy – National Priorities or Party Ideologies. Incoming presidents should not bring an agenda to the office, rather than a strategy for the future—for all Americans. Bringing an agenda to the office is not appropriate and frankly, unethical. Leave ideology behind in the crazy throes of the primaries and general election campaign. Ideology has no legitimate place in the new administration. For example, President Obama’s first term 100-day accomplishments included passage of the $787 billion economic stimulus plan; signing into law the expanded State Children’s Health Insurance Program (S-CHIP), signing the Ledbetter law requiring equal pay for women; implementing new ethics guidelines designed to significantly curtail the influence of lobbyists on the executive branch; supporting the United Nations declaration on sexual orientation and gender identity; relaxing enforcement of marijuana & immigration laws; and lifting the 7½-year ban on federal funding for embryonic stem cell research. Some of those were clearly national strategy and some appear to have been based on his own ideological agenda. Folks, it will never be 100 percent clean in this regard—there will always be a mix of national strategy based on national priorities and ideologically-based initiatives. We should hope that the new president respects the overwhelming need for national unification as Americans when he develops the first 100 days. Watch for Trust-building Actions with the Legislative Branch of Government. Similarly, problems ensue when the Congress doesn’t come up with the necessary strategy that truly reflects the will of the people, as expressed by the states. When this happens they, in essence, present a blank check to the president. That’s thwarting the natural system of checks and balances among the three branches of government. Many Republican congressional representatives and senators are pretty chipper these days because of the general election results. They have much to say about “so ready to get to work” and “accomplishing Trump’s agenda.” They might be well served, however, to review how President Reagan succeeded in a divided government by leadership and persuasion with Democrat House Leader Tip O’Neill in 1981. Just as today, Americans had voted for change and Tip recognized that very clearly. He retained his principles while cooperating with the president and the Republican-controlled Senate. Some of those politicians could barely mention Trump’s name during the primaries and the general election. After Trump’s victory, several of them somehow tried to make us believe that they championed Trump’s candidacy for the entire duration of the campaign. We expect these same elected officials to pass legislation that will benefit all Americans. Our highest respect remains with those politicians who can reach across the aisle and unify, rather than those who make loud noises about how much they can accomplish in a unified governmental setting. The former are referred to as statesmen whereas the latter are only politicians. A true leader understands his strengths and weaknesses and surrounds himself with people who can do the job. He gives them resources to accomplish their missions and ties them into the overall strategy. He celebrates their achievements, not his own. He refers to them frequently, not himself. He displays humility and a great sense of humor. When things don’t go right, he picks up the broken pieces and drives on—not laying blame and punishment. 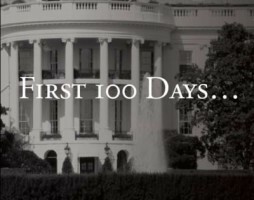 The first 100 days of any presidency has been a very important period. It sets the tone of what is to come and often serves as a trial balloon for those things that the new president wishes to undertake with the Congress. The 100-day period is considered a benchmark to measure the early success of a president. Now let’s see what lies ahead in Trump’s 100 days! Author: Bob Brescia is the executive director of the John Ben Shepperd Public Leadership Institute in Odessa, Texas His latest book is Destination Greatness – Creating a New Americanism. Bob has a doctoral degree with distinction in executive leadership from The George Washington University. He also serves as chairman of the board of Basin PBS – West Texas public television. Please contact him at [email protected] or Twitter: @Robert_Brescia.